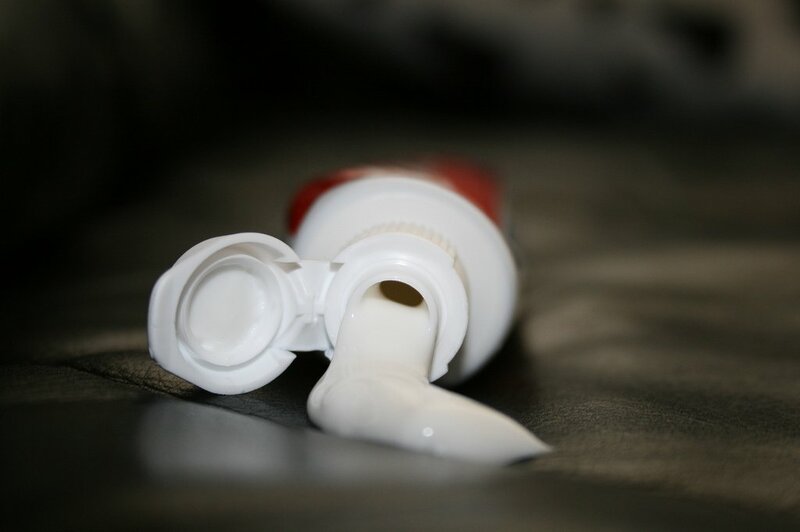 The typical toothpaste can contain a lot of things your teeth don’t necessarily need or want. Fluoride, of course, is one. Sodium lauryl sulfate is another. Regular use of fluoride toothpaste containing triclosan, an antibacterial agent, and a copolymer, which helps prevent the triclosan from being washed away by saliva, reduces plaque, gingivitis and bleeding gums and slightly reduces tooth decay compared with fluoride toothpaste without those ingredients, according to a new review in The Cochrane Library. “We are very confident that adding triclosan and copolymer to a fluoride toothpaste will lead to additional benefits, in terms of less plaque, inflammation, bleeding and tooth decay,” said Philip Riley, a researcher at the University of Manchester in England, and a co-author of the study. 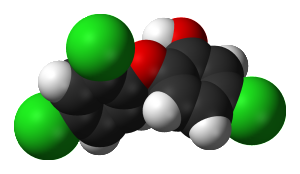 Triclosan molecule[/caption]This raises a critical question: Are those modest benefits worth the risks to human and environmental health – risks that informed the Minnesota legislation and that have prompted the FDA to finally weigh in on the matter? For although the FDA approved its dental use in 1997, they’ve otherwise given precious little guidance since 1978, when the agency “stated that triclosan was ‘not generally recognized as safe and effective’” in liquid soaps. In 2012, they said they’d finally be completing their review, then in February 2013, and now this year. Whether they finally come through this year on triclosan – and whether this will affect its prior approval for oral use – remains to be seen. And just what are the concerns with triclosan? One is that it is a suspected endocrine disruptor. It has been linked to allergies, thyroid problems and muscle impairment, including that all important muscle known as the heart. It’s also extremely difficult to remove from waste water. Once it’s in the environment, it may be transformed to highly toxic substances such as dioxins via its interaction with chlorine and sunlight. It is highly toxic to marine life, which of course has effects up the food chain. Then there’s the problem of antibiotic resistance and the rise of superbugs in an overly antiseptic world. Toothpaste doesn’t suffer from a lack of triclosan. The simple truth is this: How you brush matters more than the toothpaste you use. The thing that makes toothbrushing work is the mechanical action of it, which breaks up the sticky biofilm we call plaque. The grit in toothpaste helps it come off a little easier. This is why brushing with baking soda works: It provides some excellent grit. Essential oils such as those found in our favorite toothpaste – the Dental Herb Company’s Tooth & Gum Paste – can provide extra support for healthy gums (as well as nice flavor and some antimicrobial action). But the thing that’s cleaning your teeth and keeping them strong? Grit. And your brushing technique. Learn the right way to brush.